The Hawaiian Islands are a medley of many of the world's most fascinating cultures, brought to the region by immigrants of various ethnicities and fused together to create a diverse cultural melting pot. This international influence can be seen in various aspects of Hawaiian society, as well as in its customs, particularly in the islands' culinary styles. The cultures that have most influenced the local cuisine include American, Chinese, Filipino, Japanese, Korean, Polynesian and Portuguese. Immigrants from these countries brought with them a variety of plants and animals as well as their own distinct methods of food preparation. Along with the internationally influenced cuisine, Hawaii also features its own native recipes as well. Creative methods of preparation and innovative techniques are only a small part of what makes up the islands' cross-cultured cuisine. What really gives Hawaiian food its flare is its fresh ingredients, which are foremost in the regional food preparation. Some of the main ingredients found in local dishes include fresh fruits and vegetables, seafood, which is the highlight of Hawaiian food, and various meats, including pork. With so many styles of dining available on the Hawaiian Islands, even the pickiest vacationers are sure to find something to suit their taste buds. The price of dining in Hawaii will depend on where you choose to eat, but visitors will be able to find anything from upscale dining to less expensive fast food options, as well as meals that are priced right in the middle. Each of Hawaii's six islands has its own restaurants and eateries but, depending on the style of dining you choose, there isn't much difference in their prices. If you choose to dine at one of the islands' fine dining establishments, the cost of your meal can be around $35(USD) or higher. The moderately priced restaurants have meals that range between $10(USD) and $20(USD), while restaurants with lower meal prices are around $5(USD) to $10(USD). No matter what kind of budget you have planned for your vacation, you should be able to find a restaurant that will fit your finances. In addition to monetary considerations, vacationers should also be aware of the etiquette at Hawaiian restaurants. Overall, the islands have a very casual environment. It is common for men to wear Aloha shirts, shorts, or long pants, and for women to wear island-style dresses as accepted evening attire at most restaurants, eateries, and hotel restaurants. T-shirts are commonly worn to breakfast and lunch. Another thing to consider when dining out is reservations. Although not all restaurants require reservations, it is recommended that you call ahead to check on seating availability, especially if you're with a large party. Because Hawaii has been influenced by so many world cultures, the local dishes have been given its own unique flare. Sampling some of the islands' delicious tropical goodies can add a little spice to your travels. 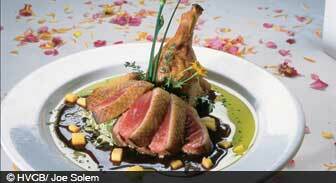 Vacationers will find that the distinctive culinary styles of Hawaii are as delicious as they are innovative.